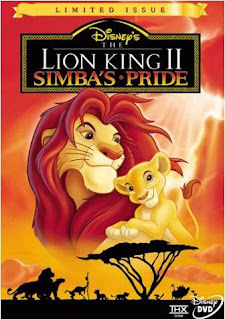 The Lion King II: Simba's Pride (later retitled The Lion King 2: Simba's Pride) is an American direct-to-video film released by the Walt Disney Company on October 27, 1998, as a sequel to the 1994 film The Lion King. It was later re-released as a special edition DVD (which altered the original title's "II" into "2") on August 31, 2004. 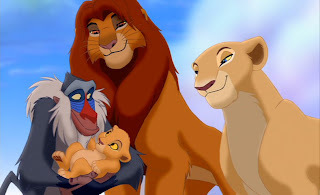 The film centers around Simba's daughter, Kiara, who falls in love with Kovu, a male lion who was raised in a pride of Scar's followers, who are Simba's enemies. 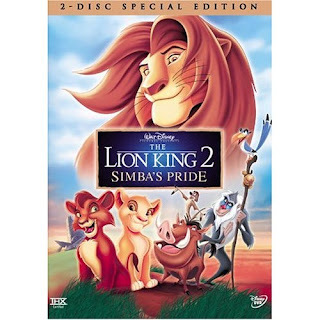 Desperate to be together, they must overcome the two obstacles that are keeping them apart: Simba and Kovu's mother, Zira.This film was not rated until the two-disc Special Edition was released. It was then given a G rating by the MPAA. While the original film's plot seems to have been inspired on the Shakespeare play Hamlet, this sequel's plot is similar to another Shakespeare play, Romeo and Juliet. The film starts with the presentation of Simba and Nala's new cub Kiara. When Kiara is older, she runs from her suffocating babysitters Timon and Pumbaa and sneaks across the borders of her father's kingdom to the 'Outlands', where she encounters an "outsider" cub named Kovu. The two soon get into trouble when they find themselves in a river surrounded by crocodiles. Luckily, Kovu "bravely" distracts them long enough for the two to escape. The cubs become friends, and Kiara attempts to initiate a game of tag, only to find Kovu has no idea how to play. In a bid to relax him, she playfully growls, but when Kovu retaliates, out of nowhere Simba appears. Kovu's mother Zira, who had been watching from the bushes, also emerges. The two face off as Simba's pride appears, and Zira reveals that the Outsiders were exiled by Simba for remaining loyal to Scar, and that Kovu was Scar's heir to the throne – and therefore a threat to Simba. However, Simba is unwilling to hurt a cub and orders the duo to leave, much to Kiara and Kovu's dismay. As they journey home, Simba scolds his daughter for breaking the rules and endangering herself, reminding her that one day she will be a queen. Meanwhile in the Outlands, Zira's adult cub Nuka complains to his younger sister Vitani about Kovu being "The Chosen One", when as the eldest the honor should be his. At that moment, Zira returns and scolds her two sons. She mocks Kovu's claim that he and Kiara are friends. She then realizes that, by using Kiara, Kovu can get close enough to Simba to murder him and take the throne. Thus, he can avenge Scar's death. Alone in his tree, Rafiki communicates with Mufasa's spirit, and voices his fear of Zira and mistrust of Kovu, brought up with hate in his heart. 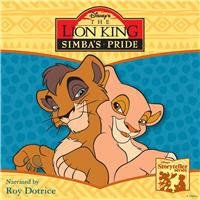 Mufasa however, has his own plan – Kovu and Kiara will be together, and unite the two prides. Time passes and Kovu grows into an adult. He is molded by Zira into the perfect assassin, with only one goal in mind: kill Simba. Kiara has also grown, and, keen to go on her first solo hunt, makes Simba promise he will let her do it alone. However, Simba sends Timon and Pumbaa after her to ensure her safety. Kiara is unable to catch anything, but is furious at her father when she finds he has lied and sent the duo to track her. Nuka and Vitani watch the events before lighting a series of fires around Kiara, trapping her. Kiara faints from the smoke as Kovu appears, as part of Zira's plan, and carries her back to the Pride Lands. Though angry at first that he has interfered, Kiara soon recognizes her old friend. However Simba, drawn by the sight of smoke, appears. Kovu lies and claims that he has left the Outsiders to become a rogue, and asks to join Simba's pride. Simba is suspicious of Kovu's story and motives. However, he is forced by law to acknowledge that he owes Kovu a debt which must be paid. He allows Kovu to stay at Pride Rock, but makes him sleep outside, separate from the lionesses. Despite this, Kiara thanks him for saving her and the two arrange for him to give her a hunting lesson the next morning. That night, Simba dreams of the day his father died. In it, Scar holds Simba back to prevent him from reaching Mufasa, telling him 'trust me'. As Mufasa falls to his death, a laughing Scar morphs into Kovu, who throws Simba from the cliff. The next morning Kovu attempts to teach Kiara to hunt properly, but the two stumble on Timon and Pumbaa, whose favorite feeding ground has been taken over by birds. They enlist the help of the lions to scare the birds off, but it soon turns into a game. Kovu, who has never played or had any real fun in his life, is confused by this new "training", but quickly starts to enjoy himself. That night, as Kovu and Kiara stargaze, he questions whether Scar is considered one of the "Great Kings", and Kiara is visibly startled. He confesses that although Scar was not his real father, he was still a part of who Kovu is, but fears that part may be the darkness that made Scar evil. As Kiara and Kovu embrace, Simba watches unseen, and asks the skies for guidance. Nala tells him that although Simba wants to walk the path expected of him, Kovu may not, and should be given a chance. As Simba leaves to ponder this, Kovu tries to pull away from Kiara, almost confessing his part in the plot against her father. Despite Kiara's pleas, he attempts to leave, but Rafiki stops him. Kovu and Kiara fall in love, and after returning home that night, Simba invites Kovu to sleep inside with the rest of the pride. Vitani watches Kovu give up a prime opportunity to murder Simba and reports back to Zira. Kovu eventually resolves to confess his true intentions to Kiara, but before he can do so Simba takes him aside for a private conversation. The two walk into the area that had been burned in the earlier bushfire, and Simba tells Kovu the true story of Scar. Kovu finally realizes he has been lied to, but Simba reassures him that, like the green roots springing through the ash, what is 'left behind can grow better than the generation before – if given the chance'. However, Zira decides to take matters into her own hands and organizes an ambush. The Outlanders chase Simba into a gorge, where he begins to scale a wall of logs to escape. Nuka, in an attempt to prove himself, tries to follow, but slips and is crushed. Kovu, who had watched the scene from above, tries to dig him out, but is shoved roughly aside by his mother. Zira lifts up a log to see her eldest son barely alive. He apologizes for failing her before dying. 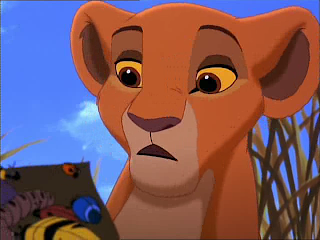 Zira blames Nuka's death on Kovu and slashes him across the face, scarring Kovu in an identical manner to Scar. Kovu defies his mother for the first time and runs back to the Pride Lands. Zira tells the other Outlanders that Simba has turned Kovu against them and declares war. Meanwhile, Simba has escaped but is badly injured. Luckily, Kiara, Timon, and Pumbaa find him and take him back to Pride Rock. Kiara refuses to believe that Kovu could be behind the attack, but she is the only one. Kovu returns and begs forgiveness. Simba refuses and exiles him, and the other animals drive him out. Kiara, confined to Pride Rock, breaks out and goes searching for Kovu. As she is about to give up, Kovu appears and the two are reunited. Kiara realizes they have to go back and stop the fighting, telling a dismayed Kovu that if they run away, the two prides will be divided forever. Meanwhile, the Outlanders march on the Pride Lands. Simba leads his lionesses to meet them, and the two clans fight. The Outlanders gain the upper hand, and Zira steps in to finish Simba off herself. However, before the two can strike, Kovu and Kiara leap in between them. Kiara pleads with her father to stop the feud and tells him that a wise king once told her 'we are one', and that there is no 'they' or 'us', but 'they are us'. Zira orders Vitani to attack, but she refuses, to which Zira furiously replies that she will die along with the Pridelanders. In disgust, the other Outsiders change sides. While Simba is momentarily distracted by the sound of the river dam cracking, Zira tries to attack, but Kiara interferes, sending them both over the cliff. Kiara lands on a jutting rock but Zira continues to slide down towards the raging river. Kiara extends her paw to try and pull Zira up, but the bitter lioness, like Scar, is unable to let go of her hate, and falls to her death. Simba announces he was wrong about Kovu and invites the Outsiders back home. All the animals in the kingdom gather as Simba, Nala, Kovu and Kiara roar proudly on top of Pride Rock. Zira's original death, which is a special feature in the DVD version, features the same dialogue as the scene which ended up in the film until Kiara says "I'll help you." Kiara lands on a rock where she is safe and tries to help Zira, who is in danger of falling in to the flooded canyon, but Zira, with a twisted grin, replies "No. Never." and releases her claws from the cliff, falling into the swollen river below and committing suicide.